The Peter J Turko Memorial race took place on a January 14th. The weather was cold and brisk and like Camelback the mountain was still recovering from the conditions created from the rain and sudden cold. Blue Mountain is always a tough start to the season, but the U10/U12 team was up for the challenge and hit that headwall like champs. The team had some excellent races. For the girls, Sophie O'Connor rocked both runs keeping her times consistent and her competition on edge and Sienna Correia in her first year as a U12 gave those older girls a scare climbing into the Top 10 with two solid times. For U10s, Effie Britt gave the U12s a run for the money and Victoria Sarsfield took on the challenging course with a slight bump in her first run but didn't let it get to her and rallied hard for the second run. On the boys side, competition heated up among the U12 PASEF team with Louis Friedrich, Tal Aluf Medina, Alessandro Leardi-Fox, Luke Sarsfield, Sasha Larrabure, Lance Albanese and Hamilton Pederson all hitting the Top 20. Louis ended up strong with a 3rd place finish in the U12 age group. 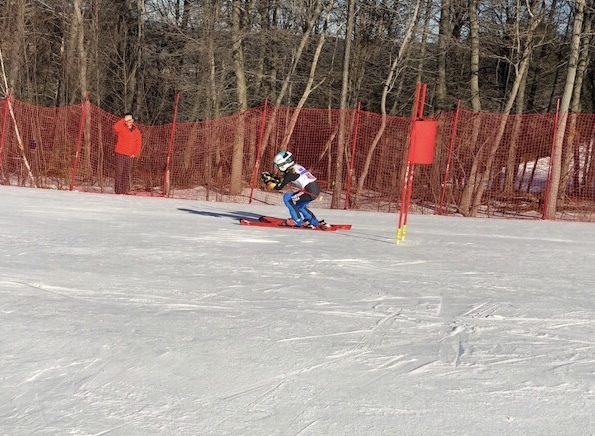 On the U10 side, Curt "Little Fried Rice" Friedrich took on the course with gusto and landed in the Top 15 of all racers with his first run. Overall, it was a great first race and the racers are primed and ready to hit Jack Frost next weekend.